I thought it would be fun to tell our engagement and proposal story-from Sean’s perspective! Read my version (or what I refer to as our “non-engagement story” here)! I’m only chiming in when it comes to outfits deets! I’m too excited about our engagement photos to hold out on sharing them any longer-but I will write a post about planning for engagement photos (outfits, location, photographer, etc) very soon! To this date, getting engaged and planning a proposal is probably one of the most nerve-wracking things I have experienced. I knew Kelsey had a daydream of her ideal proposal and wedding since she was a little girl. She had a vision. Contrary to this, I had never given either my proposal or wedding much thought. My cousin owns a jewelry store in NYC so I was confident that I could get a good deal on a ring, but other than that I had no idea where to begin. Fortunately for me, Kelsey is not very subtle about her desires. 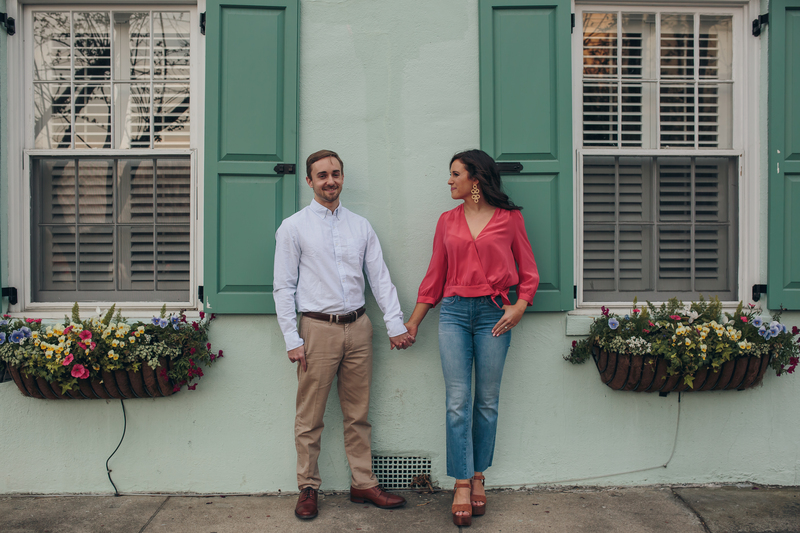 With minimal detective work I knew I absolutely had to propose in Charleston, SC (or I would likely be getting the silent treatment for at least a month). After weighing the pros and cons I decided a trip to Charleston was in order and began planning. The original date for the trip was August. Of course, I procrastinated on designing the ring and the August date approached aggressively fast. Fast forward and there’s only a couple weeks to go before the trip and the ring wasn’t ready… this was a problem. I broke the news to Kelsey creating some sort of ridiculous excuse for why the trip had to be rescheduled. She was not pleased but bought it. Did I mention she is impossible to surprise? Of course, during all this planning, it seemed like everyone we had ever knew in life got engaged. Kelsey’s frustration and anxiety about being the only one without a ring was building. Pressure built more when the already rescheduled trip had to be rescheduled again because of a hurricane. December rolls around and we make it to Charleston (I estimate I was about 3 days away from an ultimatum at this point). Of course, I had planned out in detail how I was going to propose. I had the spot picked: the gazebo in the battery. I had a few lines I wanted to say and celebratory dinner reservations for Saturday evening. Saturday rolls around and we went for a walk around town as we usually do to start our day in Charleston. I had the ring in my pocket. Of course, she goes to put her hand in my pocket. I’m sure she felt the ring box, but she played it off like it wasn’t there (smooth move Kelsey). We finally made it to battery and walked up onto the gazebo. I immediately started feeling panicky. My whole plan went out the window. I forgot any words I planned to say. I was barely able to speak English. Before I knew it, we had walked right off the gazebo and were walking out of the park. Not one to let this moment pass I got down on one knee and I literally have no idea what I said but somewhere in there I’m sure was “will you marry me”. I vaguely remember her asking “is this real?” and I’m pretty sure there was a “yes” in there somewhere. Immediately after I gave her the ring I felt like the pressure was off. I had done what I set out to do even if it didn’t go smoothly at all. All that matters to me is her happiness. She had a big smile on her face and we walked along the water as a newly engaged couple. That is so sweet of your boyfriend to plan a destination proposal! You both look so happy in these photos too – congrats! Such a sweet story from the both of you! I can’t wait to see the wedding pictures. Thank you so much Yinka!! Oh my god, this is the cutest story ever! I love how even though things don’t work out as planned they all come together in the end. These photos are absolutely incredible. Also, I need both of these outfits in my closet ASAP! Thinking about buying the same dress for an upcoming wedding. Thank you so much Logan!! YES-this dress is the best!! I ordered it thinking I was going to return it but ended up loving it out of all the dresses I tried which was a lot!! I am definitely planning on wearing it to a wedding (probably two!) this summer!! hahaa aww yes he sometimes listens!! lol!